Chance The Rapper and Kirsten Corley fully married meaning Chance is now a tied knot man. The wedding took place at Pelican Hill resort in Newport Beach, C.A. The Knot also sees the appearance of Chance The Rapper best Kanye West. Chance the rapper has accomplished hid mission on Kirsten after both twisted their relationstion. They also had a 3yrs old daughter before their marriage. 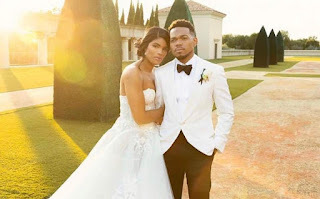 The Chicago Tribune previously reported that Chance and Kirsten had been legally married since December 27, 2018, after the paper obtained a copy of their marriage certificate. Sunday’s wedding was just to make it official to the public. It appears that the couple couldn’t wait and just went to a judge and got married.